Shelby Software Developer Tim Wilson participated in a Day of Caring with Crossroads Missions. Through its Help Build Hope ministry, Crossroads Missions constructs housing for families in need. 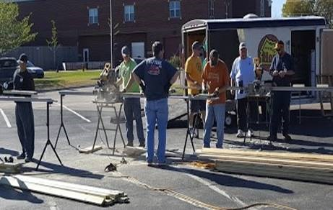 Volunteers build the frame of the house in the parking lot of New Hope Christian Church in Bartlett, TN and the frame was then transported to the building site in another state, and for this project it was Indiana. Tim and the team were completely hands-on all three days of this labor-intensive project. Day 1 involved cutting all the lumber to needed lengths. On Day 2, they worked together to complete the build in just 8 hours. Day 3 involved loading the completed frame and preparing it for transport. Tim (in the plaid shirt wielding the hammer!) is grateful for this challenging, yet rewarding opportunity.